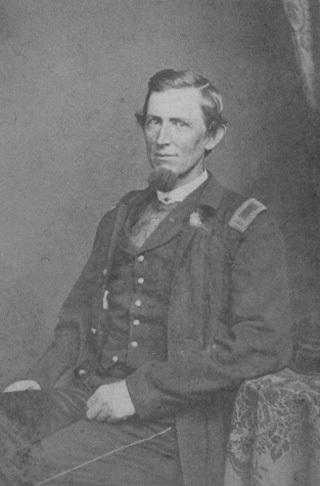 This image shows Thomas dressed in his navy blue Union Army officer's uniform, with the insignia (referred to then as 'shoulder straps') of a 1st Lieutenant on his coat. It is believed this image was taken sometime between August 1862 and June 1865. Lieutenant Brown's kepi uniform hat is just barely visible by his elbow on the table. An electronic copy of the original image, and written permission to post it on the 80th Indiana website, are courtesy of Brian and Triva Schrader. Thomas was a resident of Dover Hill in Martin County, Indiana when he was commissioned as a 1st Lieutenant by Indiana Governor Oliver P. Morton. Lieutenant Brown was mustered into the 80th Indiana on August 18, 1862 when the unit was first formed. He was mustered out of the Army on June 22, 1865 at Salisbury, North Carolina, when the 80th was disbanded after the end of the war. During his nearly 3 years' service Lieutenant Brown served on the 80th's Field & Staff as its Regimental Quarter Master, the officer responsible for the unit's equipment. All Rights Reserved. Created October 25, 2004. Last updated December 11, 2004.